This health and spa resort is well known far beyond Germany’s borders for having the right activity to suit everyone. Diversion is ensured with a variety of cycling and hiking options, as well as wonderful alpine paths. Water sports enthusiasts can explore the unique countryside from a new perspective while rafting and canyoning before the gorges, meadows and forests transform themselves during the cold season into a true winter wonderland. On foot, by carriage or on skis – here you can perfectly combine physical activity, nature and relaxation. 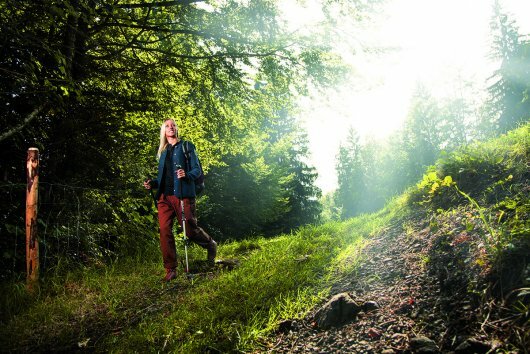 For a long time hiking has been recognised as an ideal sport for promoting health. Fittingly, in Oberstdorf you have access to the largest hiking and mountain sports region on the northern edge of the Alps. A 200 km-long network of hiking and pathways provides every visitor with their ideal route. The bicycle is also an ideal way to explore Oberstdorf’s charming surroundings. Along the 200 km of cycle and hiking paths, lush meadows and bathing lakes can be just as easily explored as deep gorges and waterfalls. From mountain bikes to e-bikes – every cyclist feels at home and finds their optimal route. On particularly hot days, a holiday in Oberstdorf can be combined perfectly with water-based fun. Here, you can go rafting or kayaking – or even go canyoning in one of the many gorges. Every holidaymaker can plunge into the streams with expert guidance and the best equipment. During the cold season, the picturesque mountain village transforms into a true winter wonderland with glittering expanses of snow, imposing mountain images and a host of possibilities. Those who like it a little quieter can contemplate the enchanting scenery from a horse-drawn carriage or experience the special atmosphere of a torch-lit hike in the snow-covered Breitach Ravine. 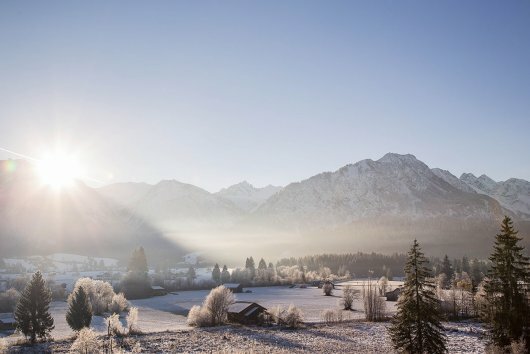 With 140 km of groomed ski slopes, Oberstdorf provides skiers and snowboarders with the largest network of winter hiking trails in the Alpine region. Several ski areas are waiting to be explored and a multitude of prepared and top-quality trails, pistes and cross-country skiing trails provide plenty of variety. Professional ski schools assist beginners and professionals alike, so that everyone can make the most of the winter paradise. And those for whom all of that is not enough can try out the latest downhill trends with airboarding and snow biking. All of which makes a winter holiday in Oberstdorf an unforgettable highlight.